The Main to Train Technical Committee Working Group reviews the latest draft of its traffic analysis report at its meeting on Tuesday, Feb. 19, 2019, in Town Hall, in Westport, Conn.
A public information meeting regarding Westport’s Main to Train study will take place March 25 at 7:30 p.m. at Town Hall, the Western Connecticut Council of Governments recently announced. The purpose of the study is to identify improvements to vehicular, bicycle and pedestrian safety and circulation along Post Road and Riverside Avenue. The meeting is the third of five that will take place over the course of the study, according to the news release, and will provide participants with the opportunity to discuss the study’s concepts in a workshop and share ideas. The goal is to create better connections between the commercial center of town and the Saugatuck train station and promote non-motorized transportation choices. 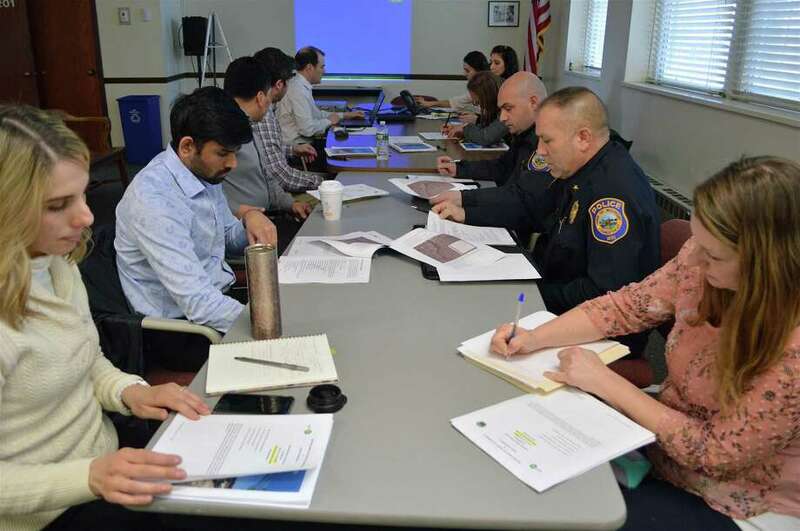 The Main to Train Technical Committee Working Group met in February, and heard concerns from the Downtown Merchants Association and the Sound Cyclists Bicycle Club about pedestrian safety along Post Road and the need for more bike lanes. The group said it was anxious for more public feedback. Residents can access details of the study at www.westportmaintotrain.com.